Japanese astronaut Akihiko Hoshides stands a the tip of the International Space Station's robotic arm during an Aug. 30, 2012, spacewalk outside the orbiting lab with crewmate Sunita Williams of NASA. After an unsuccessful attempt last week to install a new power unit to the exterior of the International Space Station, two astronauts will try again during a spacewalk on Wednesday (Sept. 5). NASA astronaut Sunita Williams and Japanese spaceflyer Akihiko Hoshide will battle stuck bolts that prevented them from properly installing the power box on the space station's backbone-like truss during their first spacewalk. Tomorrow's outing, which will be the second time the duo works outside the orbiting complex in six days, is scheduled to begin at around 7:15 a.m. EDT (1115 GMT). Williams and Hoshide spent more than eight hours upgrading the exterior of the station last Thursday (Aug. 30), but a stubborn bolt on the so-called main bus switching unit (MBSU) prevented them from securing the power box to the outpost and attaching its electrical connections. A meeting will be held today (Sept. 4) to finalize procedures, according to agency officials. 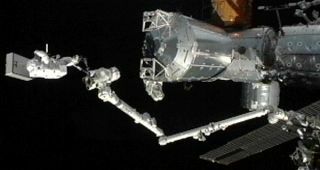 Last week, Williams and Hoshide removed a faulty MBSU and tried to install a new spare, but they were unable to drive in one of the bolts that fastens the unit to the space station's truss. After repeated attempts failed, the astronauts used a tether to temporarily tie the MBSU down, and were forced to wrap up the marathon spacewalk. If the power unit cannot be properly installed, mission managers may opt to have the astronauts bring the box inside for more analysis, NASA officials said.